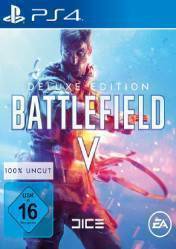 Attention: This version of Battlefield 5 Deluxe Edition is for PS4 and many of the stores listed in Gocdkeys, where you will find the best internet prices for this game and many others, offer a version in account format and other versions in cd key format. The accounts give access to the game simply by accessing them through a username and password that you will receive by email after purchase. These versions may have a regional block and are marked with the label "Account Format" in our price list. Battlefield 5 Deluxe Edition offers early access to the game, so we can play a few days before the official launch. It will give us access to 20 items per week. Five sets for the paratrooper, plus special assignments. This time, the Battfield saga will transport us to World War II, and although the engine of the game is practically the same as its previous Battlefield 1, this time we have new mechanics and a completely different atmosphere, with weapons and equipment more technologically advanced than in the First World War Battlefield 1. There are no comments yet about Battlefield 5 Deluxe Edition. You can be the first one! Let&#39;s Play Battlefield V Battle Royale Firestorm gameplay - WORLD WAR TOOLS!